If you are just starting out in the world of detailing and car polishing, then you’ve landed in the right place. Choosing the best car polisher if you are a beginner can be both time consuming and confusing. There are also a huge range of accessories such as pads and polishes to choose from. It's important to buy the right combination to suit your car and experience level. Here's my list of the best car polishers that I recommend you should check out today. 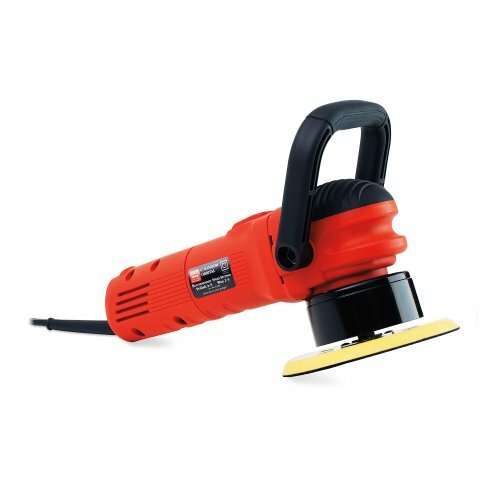 What type of polisher is best for beginners? What to look for when choosing a car polisher? How does a random orbital polisher work? What can you do with a DA polisher? Because of the way a DA polisher works, it’s very difficult to cause any damage to your vehicle’s paint. If you use the recommended pad and polish, it is virtually impossible to remove anything more than a small amount of your car’s clear coat. 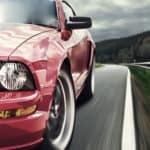 When you are shopping for a car polisher, there a few things you must take into consideration before laying down your cash. Here are a few things to consider. 1. Type ﻿﻿of ﻿﻿﻿﻿Polisher - If you are just starting out, a dual action polisher will be perfect to begin with. Forget about high speed rotary polishers for now. 2. Weight - It can take a number of hours of polishing to complete a job to perfection. Therefore, a lightweight polisher can make the job much easier on your hands and arms. It's also important to factor in the weight distribution with pads and other accessories attached. Below 6lb would be considered lightweight. Some polishers also include a counter weight. This helps with the balance of the polisher, especially when using a larger pad. 3. Variable ﻿﻿﻿﻿Polisher ﻿﻿Speed - To ensure complete control and a high end finish, you will need a polisher with variable speed settings. The speed of the pad combined with the pressure that you apply will control the level of finish that you get. It is best to start out slow, so try to choose a polisher that will start slowly, around 600-1000rpm is usually a good starting point. 4. Polisher ﻿﻿Ergonomics - If you are going to be holding a polisher for hours on end, you want something that is comfortable and easy to grip. Most polishers come with rubberized handles that are moulded to the shape of your fingers. Make sure to check out the adjustable top handle, and left or right mounted grip. Most are fully adjustable, and can also be mounted for left or right handers. 5. 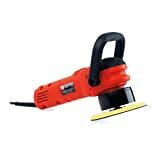 P﻿olisher accessories - Most polishers will take a wide array of accessories from different manufacturers. When purchasing your polisher think about what type of jobs you are going to undertake and this will help you choose the right pads, compounds and backing plate. 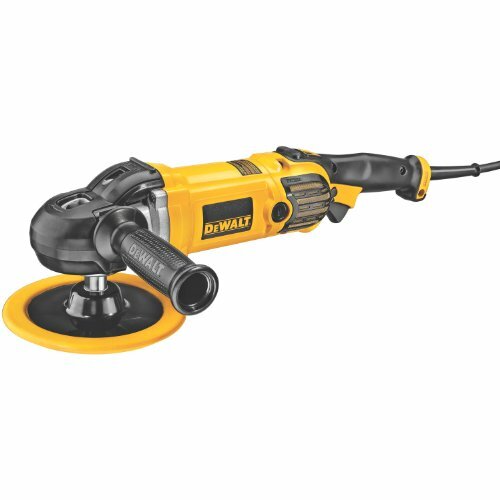 The Dewalt polisher is a lightweight, durable rotary polisher with a powerful 12 Amp soft start motor. 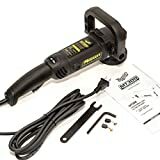 Its combination of power and durability makes it our top choice when starting out in the world of rotary polishers and it could even be the best car polisher for the money today. When you hold this polisher you can feel the quality! Featuring a non-mar, rubber gear case for improved grip, along with a three position bale handle and rubberized side handle, we found it to be solid yet very easy to hold at all angles. It also made it more comfortable to hold over extended periods of time, without ever feeling a loss of control. The precision engineered motor will push out 1250 watts at full power and 3600 RPM. This means you have enough power to quickly correct flaws in even the toughest paints and top coats. It also boasts an all ball-bearing construction and heat-treated precision-cut steel gears, so it should easily provide years of trouble free usage. The DeWalt DWP849X features ​DEWALT’s exclusive Controlled Finishing System with soft start. This excellent feature provides full control from 0 RPM right up to the max. In real world terms, this means that with this polisher, you have in your hands a versatile tool that provides improved speed control and finish quality. It delivers this by utilising an electronic module that ensures the chosen speed is maintained even when you apply high pressure to the pad. It also incorporates an easily controlled variable speed dial and variable speed trigger, that allows you to adjust the max speed from a low 600 to a relatively high 3500 RPM. This Dewalt polisher also comes with ​a 7" and 9" back plate with a 5/8" - 11 spindle thread. This adds to the wide range of versatility of this polisher, right out of the box. It is compatible with a huge array of aftermarket sponge pads, wool pads and polishing bonnets. You can also interchange the supplied plates with smaller plates if you want to use smaller pads. This polisher is very well built. We would even go as far as saying that you could use this professionally, day in day out, with very few problems. In fact, some of the reviews that we have read, are by people that are using this as part of their business on a daily basis. However, the downside of it's superior structure is that it's not as lightweight as some of it's competitors. DeWalt market it as lightweight. At 6.7 lbs, it's not the heaviest polisher out there, but it's also not the lightest. However, we think that the benefits of the sturdy build justify the extra weight and we are probably being too fussy! This is my top choice at the moment and I feel it's the best car polisher for beginners and enthusiasts. If you are just starting out then it will definitely see you through to being an experienced detailer. It's a sturdy workhorse that should take years of use and abuse, whilst delivering a top notch finish in every job that you undertake. The MT 300 Pro Power from Meguiar's is also a very popular car polisher and also one of the best dual action polishers for beginners. ​The Meguiar's MT300 Pro Power DA polisher is another excellent buffer if you are new to detailing. Meguiar's have been in the detailing business for over 100 years, and their products are always a favourite of hobbyists and professionals alike. This polisher has been on the market for a few years now, and in our opinion it's a hard wearing reliable machine. It's lightweight, coming in at only 5.4lbs. Making it another great choice for beginners. The 500 watt motor is capable of speeds ranging from 3000 to 7500 OPM. This makes it ideal for a wide array of jobs from compound cutting to fine polishing. This is another well made polisher. It's sturdy yet lightweight. 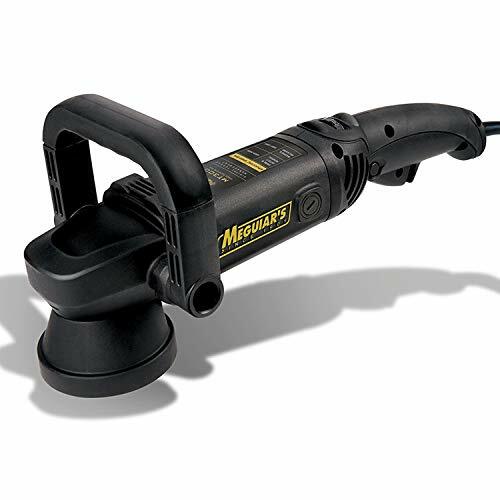 When you hold this polisher it feels like a premium product.The rubberized, ergonomically designed handles make it comfortable to hold, even after a few hours of usage. Personally, I found it was still comfortable to hold even after using it for an afternoon of removing swirl marks from a large truck. It's even possible to have good control over this polisher when it using it one handed. Just like the DeWalt, it's well built and designed to last. The billet counter weight features a triple bearing design. This counter weight is designed to match the Meguiar's backing plate, so as to give a balanced and smooth operation, even at high OPMs. ​It also features replaceable brushes. This is a handy feature that can extend the life of the polisher, especially if you are planning on using it professionally. Just like most other car polishers these days, the Meguair's MT300 features a soft start trigger button. To be honest, I wouldn't buy a polisher without this feature as it gives great control especially when you are finishing a top coat or applying a wax. You want to keep the cutting compound on the pad and not on you. ​A 5" backing plate is available separately (or is included if bought as a kit). This, Meguiar's say, was designed to complement the counter weight and the foam pads. I found this polisher to be very capable, especially at higher speeds. Even when applying a lot of pressure to the pad, it still managed to keep rotating at what appeared to be the 4500 OPM I had set it to. This demonstrates the amount of torque that the small 500 watt motor is capable of generating. It also demonstrates a feature known as Digital Torque Management that Meguiar's have included in this buffer.Digital Torque Management (DTM) is a clever feature that forces the pad to keep rotating at higher pressure.Why is this important? Well as you become more proficient with car polishers you may want to tackle more difficult corrections and deeper scratches. To do this you will need higher speeds and more pressure on the pad. Some cheaper polishers can't handle the extra load, and are useless for removing deeper marks in the paint. Whilst I didn't try the Meguiar's on anything too difficult, my guess is that it will have no problems dealing with harder paint and more difficult corrections. ​It's difficult to say anything negative about the Meguiar's MT 300. It's another great polisher from a leading force in the detailing industry. The 500 watt motor is considerably less powerful than the DeWalt on paper. This may affect its longevity if used heavily and regularly. However, there was no visible impact on performance when I used it. The other issue I had was with the lack of backing plate included in the basic pack. The Meguair's backing plate costs an extra few dollars, so it's not necessarily a deal breaker but I would have liked to see it included to make it a better choice for beginners. Griot’s Garage is a family run business that specializes in quality car products. Their 6” Random Orbital is no exception, and is another great choice for beginners and enthusiasts alike. This is the third generation of this model, and Griot’s say it’s more refined than ever. Weighing in at 7lbs with an 850 Watt motor, it displays a perfect balance of power and weight. This is great for people that have never used a polisher before. It will also suit the more experienced detailer, that wants a bit more power and control. For extra control, Griot’s went for a D handle, rather than a side handle. I like that it is adjustable through six different positions. You can even remove it altogether if you prefer, and just put your hand on the rubberized dome at the back of the polisher to apply pressure. In this 3rd generation model, Griot’s have moved the speed control dial and power trigger so that they are easier to access. The speed control is at the power cord end of the polishers body, facing you, so that it is easy to move with your thumb. The power button is at the top of the body, so that you can easily toggle it with your other hand. They have also added mould finger grips to the body of the polisher, and a fairly unique domed rubberized palm grip to the back of the polisher. This is great if you want to use the machine without the rubberised D handle. 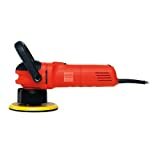 Griot’s use a 6” backing plate with this polisher. If you decide to use it with one of their polishing pads, you’ll notice that the pad is a little bit wider than the backing plate. This is a great feature of all of their pads and gives you an extra little bit of soft pad to play with. The polisher can be set to one of 6 speeds easily, by using the thumb dial. The thumb dial makes it fairly easy to start with a slower speed to spread the polish, or if you are applying a wax and then move up to a higher speed for more intense polishing. It doesn’t appear to have a soft start function, when you pull the trigger, the pad winds up to the set speed fairly quickly. So I found that every time I applied more polish to the pad, I needed lower it down to 2 or 3 on the speed dial so as not to cover myself in polish. Once the polisher starts, it’s really easy to control. I left the rubberised D handle attached (some prefer to use the domed grip for control) and I always felt like I was in total control. It’s possible to set the handle to 6 different positions, but I only ever used one. The pad oscillates 8 mm off centre (this is an 8mm throw), so it’s safe to use even if you apply a little too much pressure. One other great feature of this polisher is the extra long power cable option. The model that I used had a 25 foot cable. This made it possible to get all the way around a truck easily without worrying about needing an extension cord. This polisher is another great option for beginners, and serious enthusiasts. Personally, I missed having the option of a side handle, but that's just my personal preference. The other thing I am used to is the slow start functionality, like the one found on the DeWalt. If after applying more polish to the pad, you forget to initially lower the speed of the motor, then it can get a bit messy. It’s not a deal breaker, just takes a bit of getting used to. Here's one of the Griot's guys showing the polisher in action. Porter Cable have been around for over 100 years. They don’t necessarily specialise in detailing tools, but they have a good reputation amongst tradesmen when it comes to things like circular saws and cordless screwdrivers. The 7424XP is a compact, lightweight dual action polisher. It comes with 6” backing plate and weighs only 5.5 lbs. The 4.5 amp motor puts out 2500-6800 OPMS, so it’s powerful enough to remove heavy scratches from paintwork and metal. This is a no ‘bells and whistles polisher’. If you are looking for something flashy then this isn’t the polisher for you. However, the build quality is excellent and the whole unit only weighs 5.5 lbs. This makes easier on your arms over a longer period of time. Unlike other polishers, it doesn’t come with a D handle, so I found it more difficult to keep it flat on the paintwork at higher speeds. You do get a removable side handle, and this can be moved from the right to the left side. This is great for left handers like me. The main body of the polisher is finished in a dark grey plastic. It’s not as nice to grip as the DeWalt or Griot’s Garage polishers, but the power switch and motor speed dial are placed well for easy access. The Porter polisher is has a powerful 4.5 amp motor that is capable of up to 6,800 OPMS. When it comes to starting it up, it’s pretty much the same as other polishers. You can set the speed using the thumb dial, and then the red power button starts it up. Just like the Griot’s Garage polisher, there’s no soft start trigger. If you’ve never used a polisher with a soft start, then you may not miss it. You just need to ensure that you start off at a low speed setting using the dial. I tried this polisher with and without the side handle. I found that I had more control without the side handle, by applying pressure by placing my hand over the top of the polisher. It’s probably not the best way to hold it if you are new to polishing as it’s too easy to apply too much pressure. At full speed, you can really feel the power of the motor. I only used it to remove some swirl marks, but I would be confident that with the right pad and polish combination it would easily improve a deeper scratch. 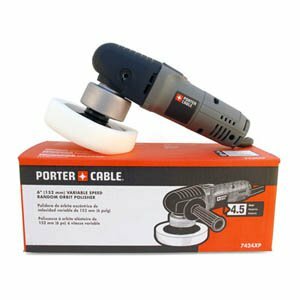 Functionally, the Porter Cable 7424XP is a great choice of polisher. It features a powerful motor and is lightweight and well built. It’s not the most comfortable polisher to hold, and personally I missed the rubberised D handle that you get with other polishers. I also missed the soft start trigger. On paper though, this is a great option for people that only need to use a polisher a few times a year, and aren’t too fussy about aesthetics or fancy rubberised handles! This one in many ways, is the pick of the bunch. If you are just starting out, and have no idea if you are going to like car polishing or not, then you can’t go wrong with a polisher that costs less than $40. 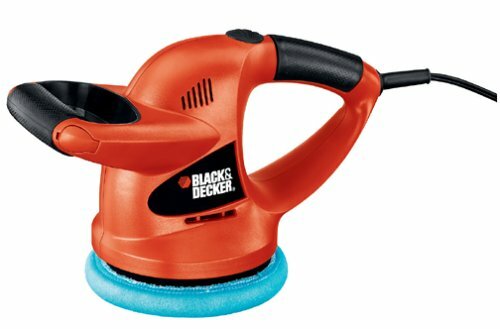 This Black & Decker DA polisher is a very lightweight, compact machine. It weighs in at just over 2 lbs and features two moulded, rubberised handles. The powerful motor generates a constant 4,400 OPMs. If you combine that with a good aftermarket polishing pad then you’ve got a powerful little car polisher in your hands. The WP900 is light. It’s comfortable to hold because of its weight and rubber coated handles. The downside of the moulded handles is that you obviously can’t adjust or remove them. So if you are using it at a height or over your head, it’s not as easy to hold it flat against the surface of the paintwork. The build quality feels ok. It’s not as sturdy a design as say the Meguiar’s or Griot’s Garage polishers. I’m doubt it would stand up to long term, heavy use. This polisher will in theory remove heavy scratches from paintwork. The 4,400 OPM output is similar to other high powered polishers that I have talked about earlier. The 7” backplate can be used with your choice of aftermarket pads. I’d recommend buying a decent pad, because the foam pad that comes in the box isn’t great in my opinion. Because this polisher doesn’t have a slow start trigger of variable speed dial, it gets up to top speed fairly quickly. It’s not too much of a problem, as long as you don’t put too much polish on the pad before you begin. For straight forward paint correction, or buffing, this polisher will do the job, albeit without the frills of more expensive polishers. The two big negatives have to be the lack of adjustable handles and slow start motor. As you get more proficient at polishing and start to tackle more delicate jobs then the lack of a variable speed motor will be a hindrance. The handles aren’t a deal breaker, but they do make it harder on your arms if you are trying to hold the polisher flat while in an awkward position. Couple that with the lack of a variable speed and it can be difficult to hold the polisher steady. In saying that, I wouldn’t let these issues put me off buying it. It’s a great little polisher, that costs less than some polishing pads. A random orbital polisher works by rotating a pad on a central spindle. As the pad rotates, so too does the spindle in an orbital fashion. Kinda like a planet rotating around the sun. The planet is rotating while traveling in an orbit around the sun. Because the pad is moving in an irregular motion, it is near impossible to burn through the paint on your vehicle. In fact, if you apply too much pressure, the pad will come to a stop. For this reason, a random orbital (DA) polisher is great for beginners. This type of polisher is great for removing both light and deep swirls and scratches from your car’s paintwork. It can also be used to apply waxes and sealants. I like to clay the paintwork of my truck twice a year. Afterwards, I always use my DA polisher at a low speed to apply a coat of wax. 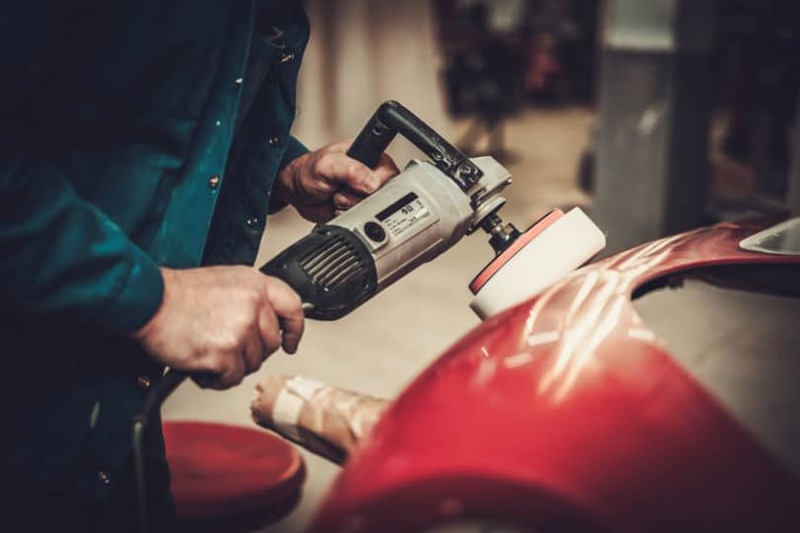 If you want to remove more than a light scratch, or damage that is deeper than your car’s clear coat then you will need the help of an experienced detailer with a rotary polisher. You can also use a polisher on other parts of your car. They are great for removing scratches and for applying wax to chrome wheels and bumpers. They can also be used to help restore headlights to factory condition. 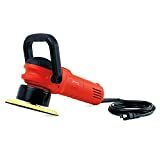 You can also use a polisher on your boat, motorhome or even around the house. What is a Rotary Polisher? A rotary polisher spins the pad on a single circular rotating axis. There is no oscillating movement of the spindle. This results in heat building up quickly between the pad and paintwork. Because of this, a rotary polisher is a very effective means of correcting paint defects, but in the wrong hands can cause serious damage too. So a rotary polisher is best left in the hands of a professional, or an experienced enthusiast. Heating of the paintwork is created very quickly in one area. We've gone into a lot of detail in this list of top car buffers. You should now be in a better position to choose your first car polisher. If you still can't decide, have another look through our top list below.